The outbreak of Ebola in West Africa constitutes the largest and most complex to date. Declared a public health emergency of international concern by the World Health Organization (WHO), the outbreak of a disease with no known treatment or vaccination is proving difficult to contain given the already fragile and under resourced health systems in the affected areas. To assist health workers and researchers working under difficult and dangerous conditions to bring this outbreak to a close, The Lancet has created an Ebola Resource Centre. 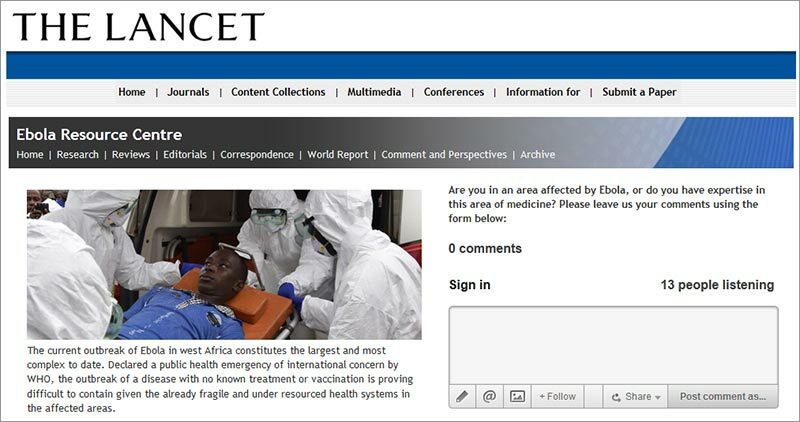 This hub brings together existing Ebola content from The Lancet journals and Cell Press and will feature the latest Ebola research as it is published. It is intended to be a comprehensive Ebola resource for clinicians, public health professionals, and anybody else who needs access to existing Ebola research and latest developments. All content on the site is free to access. Researchers and health authorities need to ensure that experimental drugs to treat Ebola are distributed fairly, and in the context of randomized controlled trials, according to a new Viewpoint published in The Lancet. Leading bioethicists Professor Ezekiel Emanuel of the University of Pennsylvania and Dr Annette Rid, of King's College London outline critical ethical principles which need to be adhered to if experimental drugs are to be deployed in the Ebola outbreak, stating that the patients selected to receive such drugs must not be limited to well-off or well-connected patients – including health care professionals. They also point out that, given the limited supply of experimental drugs and their low probability of success, containment of the epidemic and strengthening health systems in affected regions should be a priority. Read the full Viewpoint.